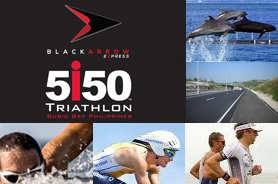 Sunrise Sprint will be on November 4 as a sub-category to the Black Arrow Express 5150 Triathlon in Subic Bay, the S2 is the short distance race that will give you that fun and friendly racing experience that can be found in every Sunrise brand of triathlon racing but with lesser of the challenges that are ever-present in its longer-distance race predecessors. A 5+1 registration promo is available plus awards will be given to the Top 3 Teams with the best 5 cumulative finish times! There has never been a good time to TRI but NOW! See you all in Subic Bay!